Our first televised fight is over, and FrostBite ekes out a victory against the crowd-favorite Overkill. For more details, see our Overkill battle description on our Las Vegas trip report page. 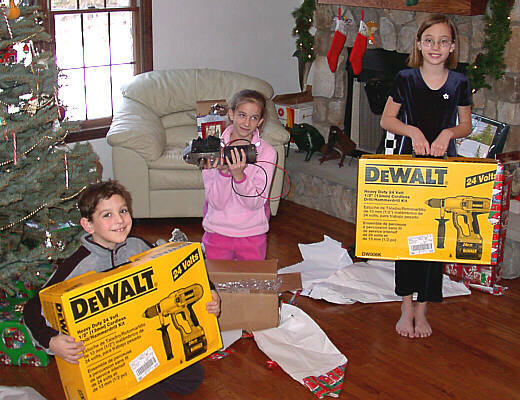 Santa has come and gone, and the kids all got robot parts for Christmas. The day we've been waiting for for 8 weeks finally arrived...our first significant snowfall. 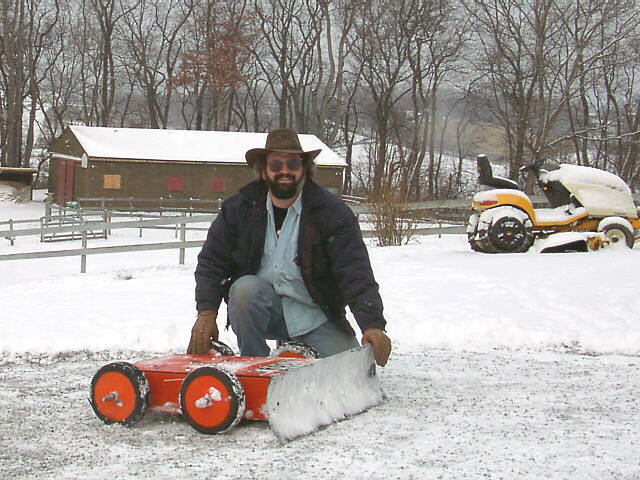 And FrostBite was ready to plow...we pounded the dents out of the blade, charged up the Hawkers, and headed outside. We figured we'd need little tiny chains for the tires, but since this was just powedered snow, and not an ice storm, the wheels bit just fine. We'll still make chains for it, though, that would just be too cool for words. We only did the area behind the garage (about 800 square feet, the same size as average two car driveway). The blade height is still just a little too low for snow, and the gravel under the snow is not very even. 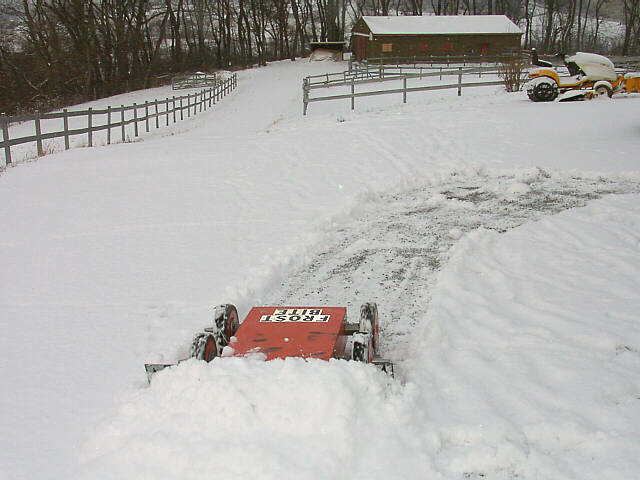 But we did verify that the basic concept of using FrostBite to plow the driveway from inside the house is workable. 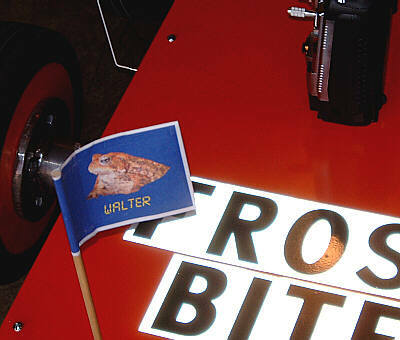 Check the video area for new videos of FrostBite playing in the snow. Team Toad will likely be entering all weight classes in the next event. We've been ordering parts for the last two weeks, and things are starting to arrive. 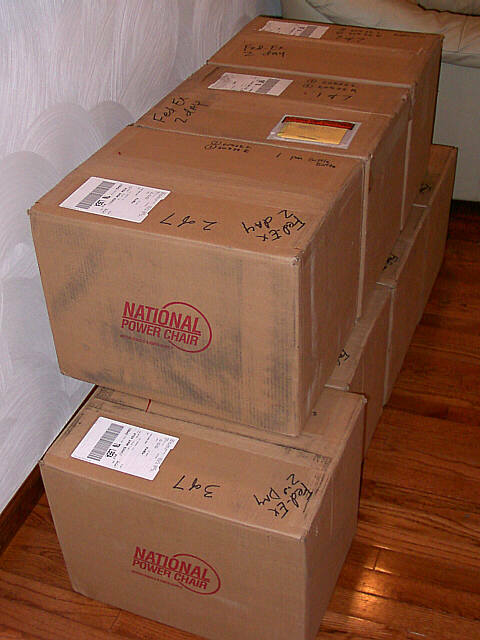 Fed Ex dropped off 7 boxes from National Power Chair this morning. That's 14 new wheelchair motors. Four will go into the new version of FrostBite (we're keeping the old FrostBite together for adversary testing), eight will go into a new super heavyweight called Iceberg, and two will be spares. We've acquired 8 Hawker Genesis G13EP batteries, and a TrueCharge 20 amp 3 bank charger, and we ran some battery charging tests yesterday. 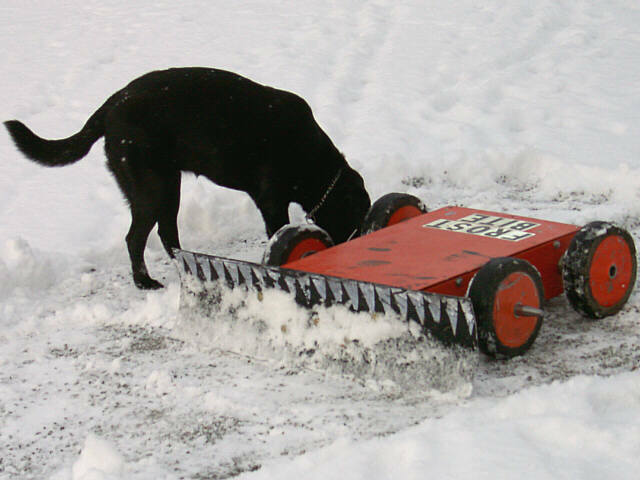 Ice cube, middleweight, 4 wheeled pneumatic flipper (Kelsey). Lock Down, middleweight, 4 wheeled pneumatic spike/wedge (Danny). Snow Flake, lightweight, the Mini-Me version of FrostBite (Jacey). Our challenge is how to get 5 robots into 4 weight classes. 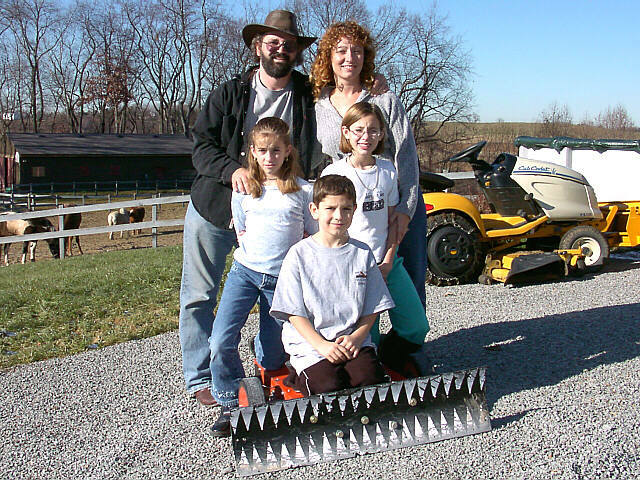 We may have to have an elimination round here at the Lazy Toad Ranch, or we may have to rent one of the children to another team for the next event. 22 wheelchair motors, 14 24v, and 8 12v. 4 Futaba 8UAPS radio controls. 10 Vantec ESCs: 4 RDFR23's, 2 RDFR33's, and 4 RDFR36e's. Yes, we're cool parents. No, we're not accepting applications for adoptees. We had such a good time at BB Las Vegas, that the kids have decided they all want to build their own robots. We spent this weekend in design meetings. Dan and Fuzzy installed Hawker Genesis G13-EP's in FrostBite, to overcome the battery capacity problem we discovered in Las Vegas. 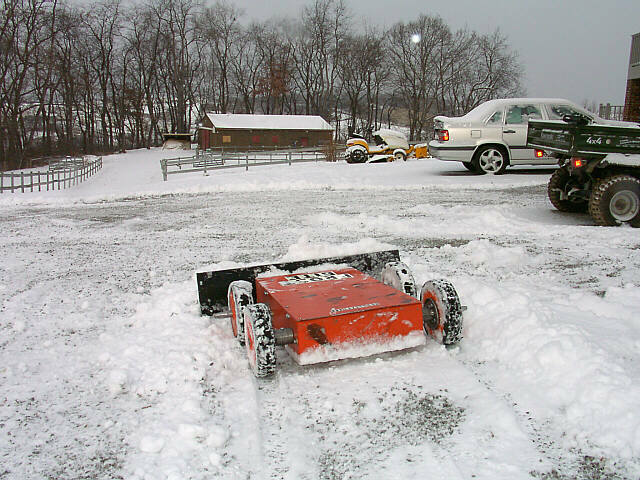 With 3 Hawkers to generate 39 volts, FrostBite can plow the driveway for 15-20 minutes. We hope that will be enough capacity for even the toughest pushing battles. That added almost 20 pounds to our weight, so now our job is getting FrostBite on a diet to lose 16 pounds. 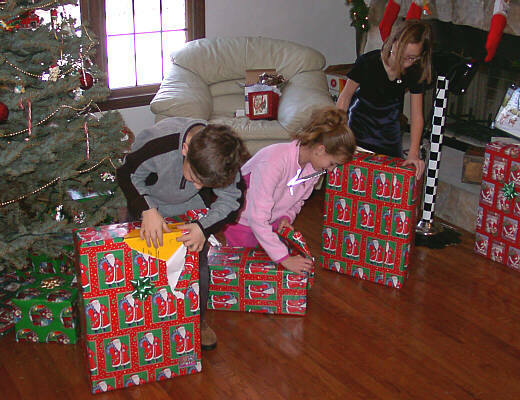 We plan to get half by squeezing the body down, making the inside space usage more efficient. The rest will have to come from lightening some of the other components...the steel hubs and wheel spikes being likely candidates. The current hubs weigh 4.5 pounds, each. 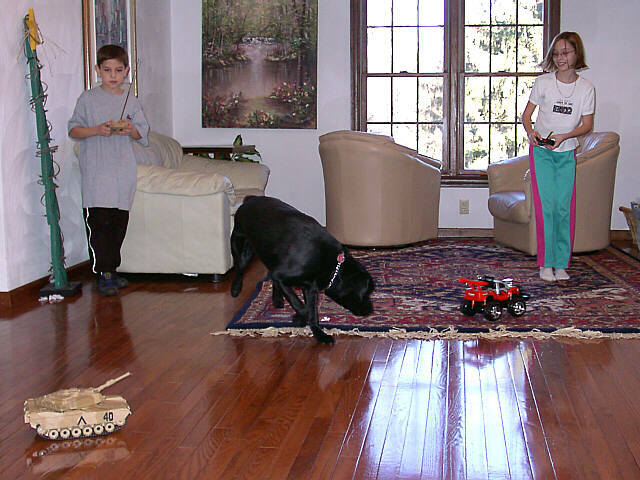 We decided to take our own advice, and use R/C cars to practice our driving skills. 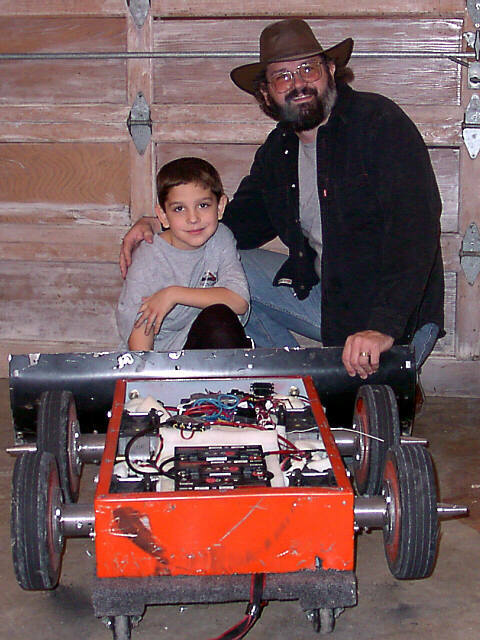 If the kids want to compete with their own robots, they have to all be good drivers. 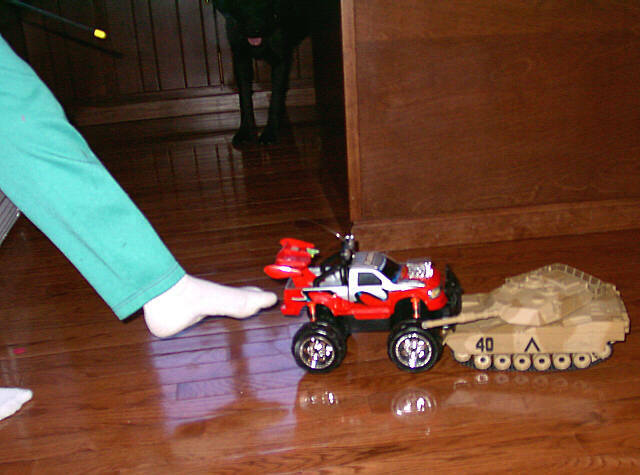 We enlisted our dog "Maggie" to act as a hazard, and gave each kid a practice vehicle. 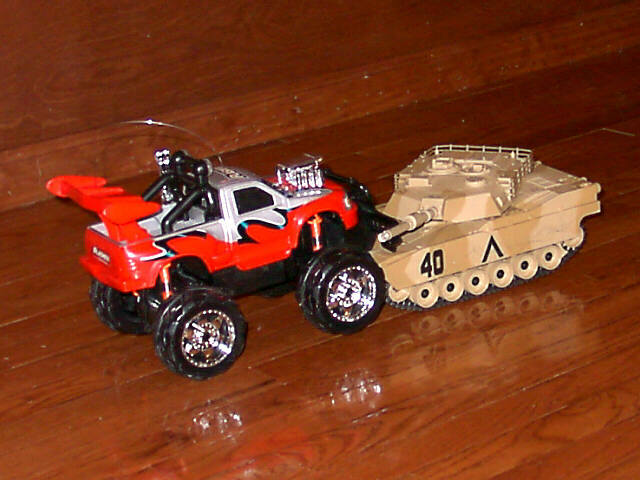 Sure enough, we soon had a classic pushing battle where the stronger but slower tank was gradually gaining ground against the faster but less powerful truck. Kelsey, who was driving the truck, developed a successful but illegal assist maneuver to prevent the truck from being pushed into the dog.